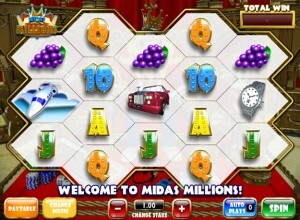 Midas Millions Slots - Review the game to win big! Step 1 – Clicking on the +/- stake button will increase or decrease your bet in Midas Millions Slots between £0.10p and £200. Step 2 – There is no way to adjust the number of pay lines in Midas Millions Slots. This is both a blessing and curse. Step 3 – The game features auto play if you want to keep the same wager on every spin. If not simply click on the green spin button to begin single wager play. Midas Millions slots machine is very reminiscent of an old British game show entitled Blockbusters. Being unable to adjust the amount of pay lines you are able to play with is a disadvantage, though it does mean the larger bingo jackpots are more accessible to you. The Midas Millions Slots game requires you match up one of the winning combinations of watches, numbers, letters, airplanes, champagne bottles, grapes, cars and Midas Millions logos found on its “reels”. Midas Millions Slots features the Midas Millions logo as the wild card and accumulated them in a row will turn your other matching symbols in a given pay line golden in colour, resulting in a double pay-off. Free spins are activated by picking up the crown logo, with cheekily has the words “”free spins”” written underneath. More than three of these in a winning board will results in several free spins, and a multiplied bet heading your way.